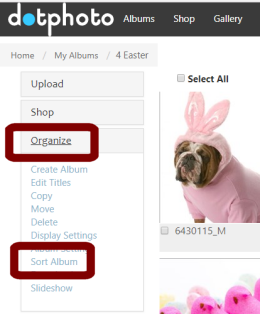 To re-arrange the order of photos in any dotphoto album, choose theÂ OrganizeÂ menu on the left and thenÂ Sort Album. Under the Sort Album, you can automatically sort by photo title, date or upload date — or you canÂ manually drag-and-drop photosÂ to whatever order you want. This is particularly helpful when making a dotphoto slideshow.